CALISTOGA, Calif. (July 30, 2017) – The three-week summer break between American Flat Track rounds did nothing to cool off the red hot Jared Mees as the 2017 AFT Twins presented by Vance & Hines title fight picked back up at the Harley-Davidson Calistoga Half-Mile presented by Cycle Gear. Seemingly out of sorts during qualifying and even into his Heat race, Mees proved to be an unstoppable juggernaut around Calistoga Speedway aboard his No. 9 Indian Motorcycle Rogers Racing Scout FTR750 by the time the Main Event arrived. The title leader was consistently four- to five-tenths superior each lap compared to his nearest pursuer. As a result, he worked up 3.254 seconds worth of padding by lap 9 of a scheduled 25 when the race was temporarily halted due to a red flag. Rather than be discouraged after seeing that huge lead erased in an instant, Mees simply went back to work. He proceeded to rip open an even larger 3.476-second margin during the first nine laps that followed the restart, and the title leader’s drama-free march at the front saw him as much as 4.548 seconds out in front as the race neared its conclusion. 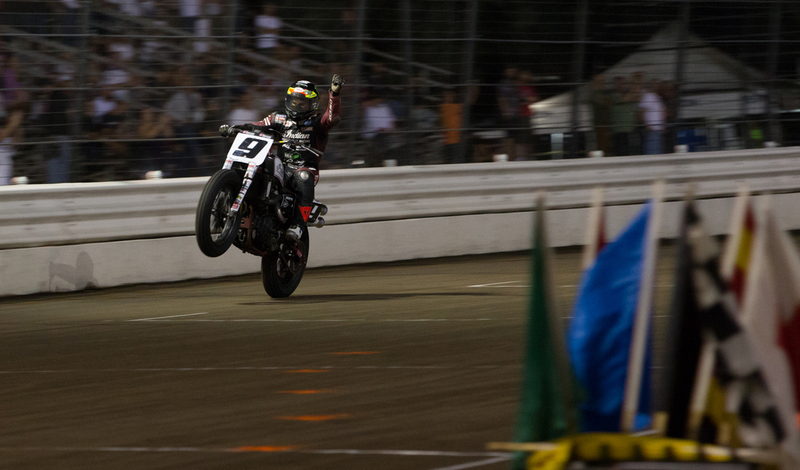 Mees ultimately cruised to a 3.571-second margin of victory, sailing by the checkered flag in a one-handed wheelie. The three-time Grand National Champion now boasts an 18-point championship advantage and has clearly turned the tide of momentum in his favor with four wins in his last five outings. Second place went to Sammy Halbert (No. 69 Estenson Logistics Yamaha FZ-07) in convincing fashion, coming on the heels of his vastly impressive X Games gold medal performance a couple weeks back. Runner-up Halbert said, “We had a great bike right from the get-go. We were really fast in qualifying, but the track was changing a lot, going from really hooked up to a bit slick. It’s a little more challenging for me on this bike when it’s slick. But we still made huge gains today, and my boys had it working good for the Main Event where I was able to run a solid second. The most spirited battle in the top 10 was waged by teammates to decide the final spot on the podium. In the end, Brad Baker (No. 6 Indian Motorcycle Racing backed by Allstate Scout FTR750) kept Bryan Smith (No. 1 Indian Motorcycle Racing backed by Allstate Scout FTR750) at bay by a meager 0.067 of a second to finish in third. While Baker was happy enough to edge Smith out and land on the box for the eighth time in 2017, he admitted his frustration at still seeking his first win aboard the potent Scout FTR750. For Smith, the close fourth was an encouraging uptick in form following consecutive sixth- and seventh-place runs. However, it also marked his third straight finish off the podium and his fifth in a row without a win after powering to four successive victories earlier this season. Lima Half-Mile winner Briar Bauman (No. 14 Zanotti Racing Kawasaki Ninja 650) rounded out the top five, taking the checkered flag less than a second behind Smith. Fifth-ranked Jeffrey Carver Jr. (No. 23 Carver’s BBQ Kawasaki Ninja 650) finished one further spot back in sixth. 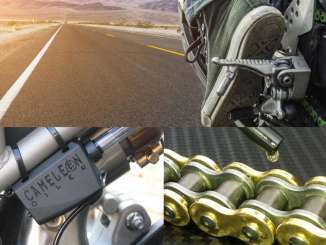 Factory Harley-Davidson riders Brandon Robinson (No. 44 Harley-Davidson Factory Flat Track Team XG750R), Kenny Coolbeth, Jr. (No. 2 Harley-Davidson Factory Flat Track Team XG750R), and Jake Johnson (No. 5 Harley-Davidson Factory Flat Track Team XG750R) all made their way to the Main at Calistoga, finishing ninth, 12th, and 15th, respectively. Suggesting that Tanner Dean (No. 138 Walrath Racing Honda CRF450R) came out of nowhere to win Saturday’s AFT Singles race at the Calistoga Half-Mile may be an exaggeration, but not by much. The race was just Dean’s fourth-career AFT Singles race, and his first ever attempt at a Half-Mile National. His previous best finish was 11th (twice), so it’s safe to assume the category’s usual suspects were taken a bit off guard by his sudden arrival at the front this weekend. Dean gave plenty of warning in the lead-up to the race, however. He posted the fastest time in qualifying, won his Heat, and finished second in his Semi only after getting bumped off line late. The sport’s newest star made no rookie mistakes as he scored the win despite being hounded in the Main Event by a motivated Brandon Price (No. 92 Brandon Price Racing backed by Parkinson Brothers Racing/DPC Racing/Don’s Honda CRF450R), with third-place finisher Kolby Carlile (No. 36 Estenson Racing Yamaha YZ450F) also in hot pursuit. If not for the stunning emergence of Dean, the respective results of Price and Carlile would have been the biggest news of the night in AFT Singles action. The intrigue was amped up by their linked seat shuffle, with Carlile putting in a promising first performance aboard the Estenson Yamaha, and Price going one better in his first attempt on the Parkinson Brothers Honda vacated by Carlile. Ben Lowe (No. 20 Bruce Lowe Excavating Honda CRF450R) finished fourth with AFT Singles championship leader Shayna Texter (No. 52 Richie Morris Racing Honda CRF450R) on spot behind in fifth. Texter actually came up big to score her top-five points haul after running down near the bottom of the top 10 for much of the contest. As a result, she now holds a mammoth 29-point advantage but may require every bit of it with a TT – her weakest discipline – now looming on the series’ slate.